Welcome! You’re probably here because you’re struggling with chronic health concerns, stress, or pain. Maybe you’re noticing that you’re not able to enjoy life as you once did. If you feel drained, frustrated, or worried, you are not alone. Many of our Patient’s come to us after years of feeling ‘off’ in their life. Many of them try everything that conventional medicine has to offer, yet never get lasting results. I have been there too and understand how difficult this can be. Eventually, chronic health challenges begin to take their toll on all important areas of life. If you’re noticing that your work performance has suffered, or that you can’t take the small ones in be as present for your kids as you want, or upper right corners down even that your relationships aren’t as fulfilling or healthy as they should be, it’s time to change this starting NOW. Without your health, it’s impossible to feel truly fulfilled and happy in life. The truth is, without the right intervention, most health conditions naturally get worse over time. Stress alone can be a cause of this. You’re here because you are ready to take control and get your health and life back. You know that putting this off, or continuing to do what you’ve been doing, is NOT the solution. The approach that I offer is designed to treat the root cause or your health concerns, not just put another band aid on your symptoms. Not only can my approach help to manage your symptoms; it often leads to many unexpected benefits. My clients typically report that their energy level is better than it’s been in years. They feel more comfortable in their body. They sleep better and wake up feeling refreshed. Their confidence and peace of mind is restored. They are able to handle stress and the ups and downs of life without feeling overwhelmed or drained. Can I guarantee a specific result for you? No. But what I CAN promise you is that if you commit to the process and make your health a top priority in your life, I will meet you there and do everything possible to get you better FAST. The clients who get the incredible outcomes described above are the ones who take responsibility for their health, value our suggestions and guidance, and commit to the recommended treatment plan. Ready to take action? 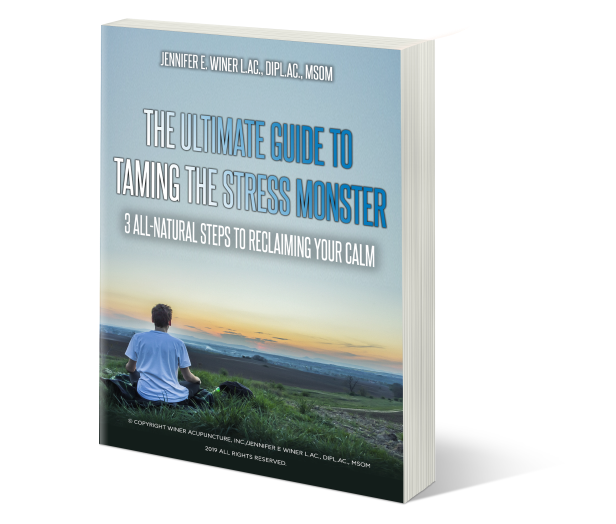 Schedule today and Download our free Ebook to learn more about how to manage stress, reclaim your calm, and how Winer Acupuncture, Inc. can help you. Acupuncture originated in China over 3,000 years ago. It is part of the holistic system of healing known as Traditional Chinese Medicine. Our mission is to improve our patient's quality of life through Acupuncture and Traditional Chinese Medicine. The root of poor health often lies deeper than its manifested symptoms. Therefore we believe in taking a holistic approach to healthcare, treating not only the immediate pain and symptoms but also improving the body's overall health so that our natural immunity is more effective in combating illness. We are dedicated to the highest level of integrity and excellence in Acupuncture and Traditional Chinese Medicine healthcare. Winer Acupuncture, Inc. promises our patients that we will listen to their concerns and insights, honor their experiences and wishes, and provide a comforting, secure and confidential healing environment. We compassionately support our patients in their healthcare choices. Winer Acupuncture has been recognized as one of the top Golden Valley Acupuncture practices. “The doctor of the future will give no medication, but will interest his patients in the care of the human frame, diet and in the cause and prevention of disease." I started seeing Jennifer for infertility issues. She supported me through the ups and downs. After I conceived, her treatments worked well to abate the "side effects" of pregnancy. Her knowledge of both Western and Eastern medicines is amazing, and I always walked out of her office having learned something new. Jen was also present at the birth of my son, helping with pain management. Her calm presence was a treasure. Highly recommended! ~ S.H. Video testimonial about Winer Acupuncture, Inc. helping with Bells palsy. Video testimonial about Winer Acupuncture, Inc. helping with weight gain, sugar cravings and joint pain ~ T.R.